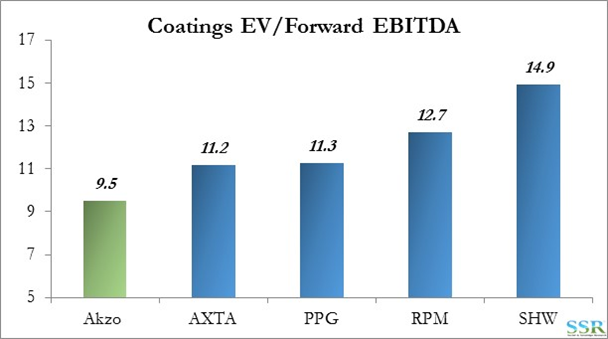 SSR LLC – Akzo/PPG– Maybe the DEVIL is in the details – Did PPG dodge a bullet? We have followed the chemical industry for 35 years and one of the “curses” of M&A has been the environmental liabilities hidden (sometimes literally) in the acquired company. The commercial logic of Akzo/PPG makes complete sense and so something else must be going on. Is it just the intransigence of Akzo’s management or are there hidden liabilities (perhaps dating back to the ICI acquisition) that Akzo wants to keep hidden. Equally important – why was the inadequacy of the proposed break-up fee such a prominent message in the recent letter sent to PPG – did Akzo think that due diligence would lead PPG to the conclusion that the company was worth less than expected – and want to walk? Despite due diligence – which may have been simply taking Union Carbide at its word – DOW took on billions of unexpected asbestos liabilities with the purchase of Carbide. Due diligence from PPG might have raised issues that Akzo is not yet ready or does not yet have enough data to address and would explain why the company was not willing to take the next step and why a high break-up fee was so important. 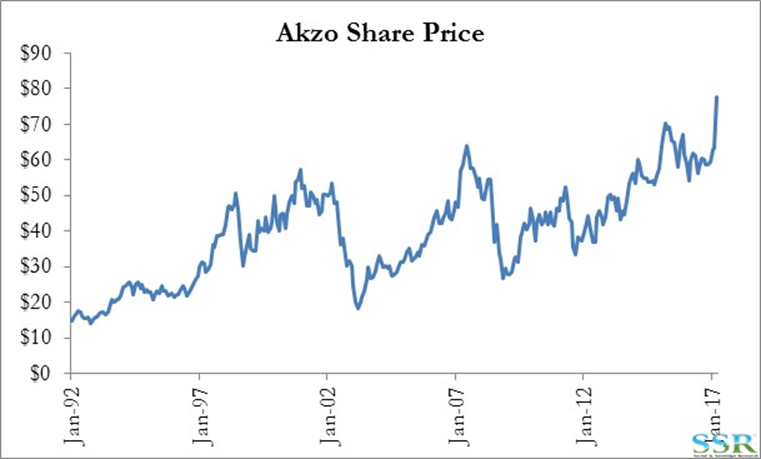 Akzo remains relatively attractive – Exhibit 1 – but does not warrant a higher multiple, in our view, given its slower growth and its significant return on capital gap – Exhibit 2. The stock has appreciated significantly – in large part due to the PPG bid – Exhibit 3, and we would rather own PPG today. 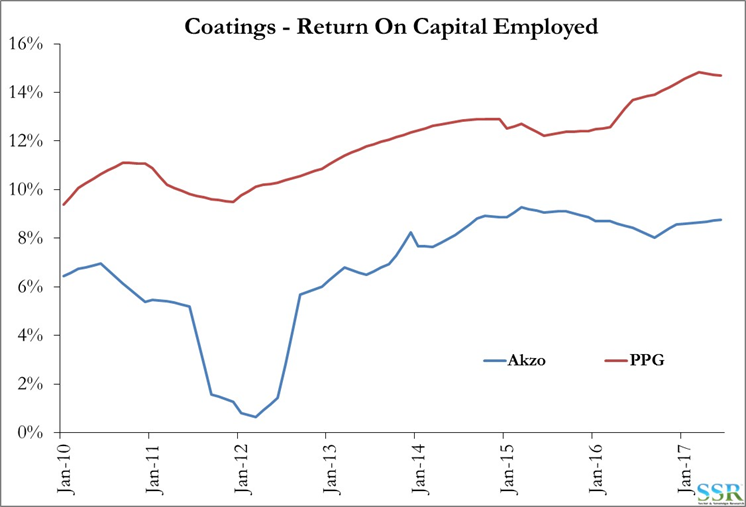 We would need to understand more fully why Akzo re-buffed PPG before we would recommend Akzo as an investment.